Ricky's on vacation and he's driving Lucy crazy just hanging around the house. She suggests: "Honey, why don't you call up little Freddie Mertz and ask him to come over and play?" Discussing his idleness with Ethel, Lucy realizes that her husband needs a project to keep him busy. How about that brick barbecue he's been promising to build on the patio? Ethel: "Why don't you do what I do with Fred when I want to do something? I start it, and when he sees I'm doing it all wrong, he takes over." Ethel's suggestion works like a charm, when Ricky and Fred see the gals slinging bricks and cement everywhere, they agree to do the job. In the midst of the project, Ricky discovers Lucy's wedding ring precariously near the bucket of cement. To teach her a lesson, he decides not to tell her he found it. It doesn't take Lucy long to realize the ring is missing from her finger and when she traces her steps back to the fireplace project, she immediately assumes the ring is in the cement mixture holding together the barbecue. Late that night, she and Ethel converge on the patio and proceed to tear the new structure apart brick by brick. Ethel: "It's times like these when I wish I kept a diary so I could write, 'Dear diary, Tonight I went out to the backyard and felt through wet cement.' "
When Ricky sees the travesty the next morning, he hits the ceiling: "What happened to our beautiful barbecue?" Lucy: "An earthquake?" Ricky: "They don't have earthquakes in Connecticut." Lucy: "A tornado?" Ricky: "They don't have tornadoes in Connecticut." Lucy: "Boy, this is a dull state!" Ricky: "I think it was a couple of hurricanes, Hurricane Lucy and Hurricane Ethel." 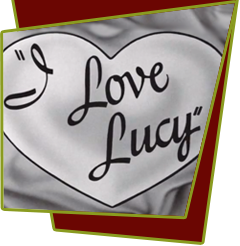 When Lucy explains the truth, Ricky accepts the blame, telling Lucy that her wedding ring can be found in the pocket of his old work shirt. But Lucy gave the old shirt to Ethel for a rag, who in turn gave it to Fred, who gave it to Little Ricky to use as a tail for his kite, which just flew away. Heartbroken, Lucy can't enjoy the first hamburger cooked on the new grill: "How can I eat when my wedding ring is somewhere over the Long Island Sound?" As she takes a reluctant bite of her burger, she discovers the ring inside. It had fallen from Ricky's pocket the day before when he bent over to pick up the platter of meat. Special Notes: In real life, when Lucy and Desi eloped in 1940, he bought her a brass ring but later had the same ring recovered in platinum. Bloopers: Desi mouths Fred's line right along with him during the "building of the Bar-B-Q" when he mentions how fat Ethel's fingers have gotten.